# Wash the vegetables, drain their extra water. 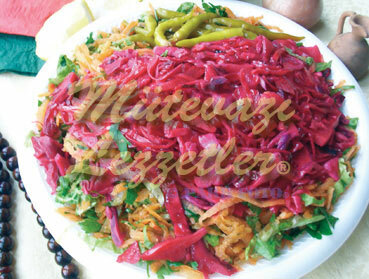 # Slit the leaves of red cabbage at first, and then slice them finely. Slice the cabbage lettuce leaves by the same method also, grate the carrots thickly, and finely slice the green onions and parsley stems. # Whisk the mixture of vinegar, olive oil and salt in a small bowl. # Place all the ingredients except parsley into a large pot for mixing them easily. # Pour the liquid mixture all over and mix it without damaging the vegetables. # Place onto the service plate,, sprinkle parsley all over, garnish with pickle and serve it as a garniture with the kebab and meat meals. Note: You must not slice the vegetables so finely, because the feeding values of the vegetables decreases in that case.